aloo dum biryani recipe | baby potato biryani in cooker | dum aloo biryani with detailed photo and video recipe. dum aloo biryani is an adapted version of traditional biryani recipe. aloo dum biryani recipe | potato biryani in cooker with step by step photo and video recipe. 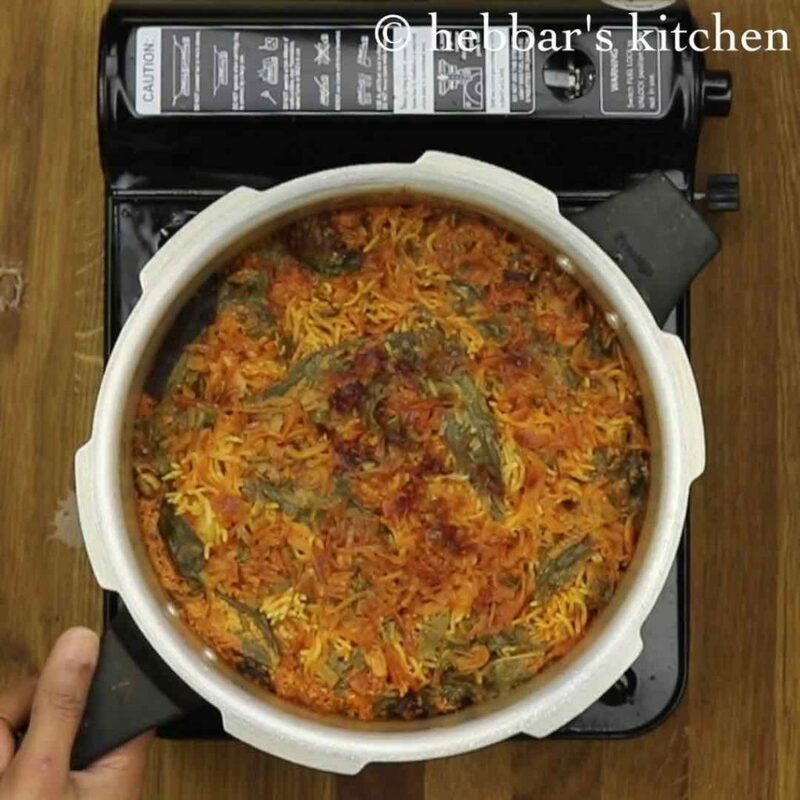 traditionally, biryani recipes are prepared with mixed vegetables and meat. however, there are several other variants to this age old recipe. out of this dum aloo biryani is one of them. basically this recipe is a fusion of dum aloo recipe with the biryani recipe. 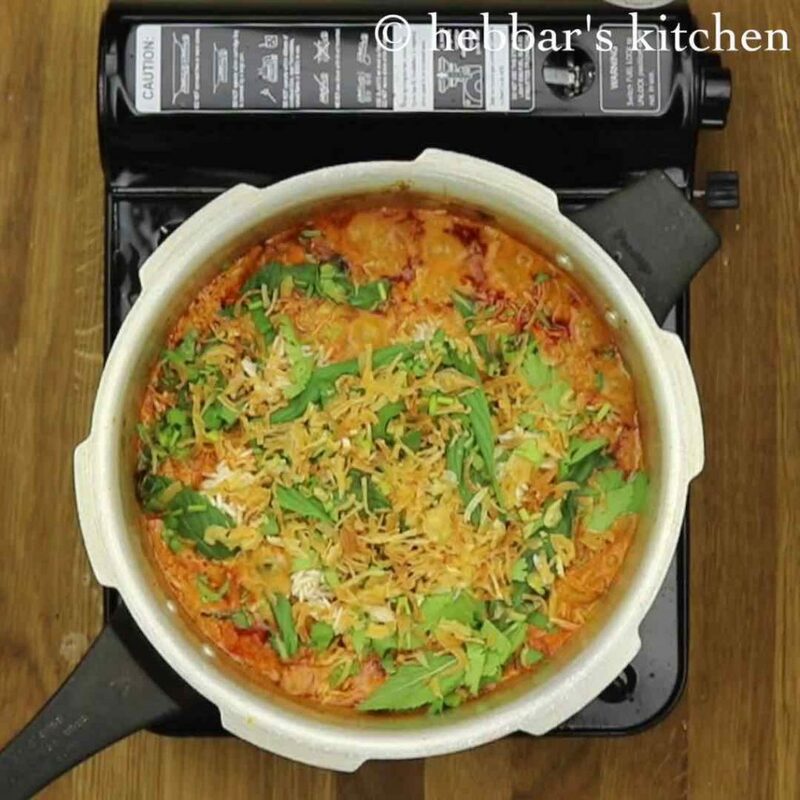 optionally, you can add the other vegetables to make it mixed veg biryani recipe. 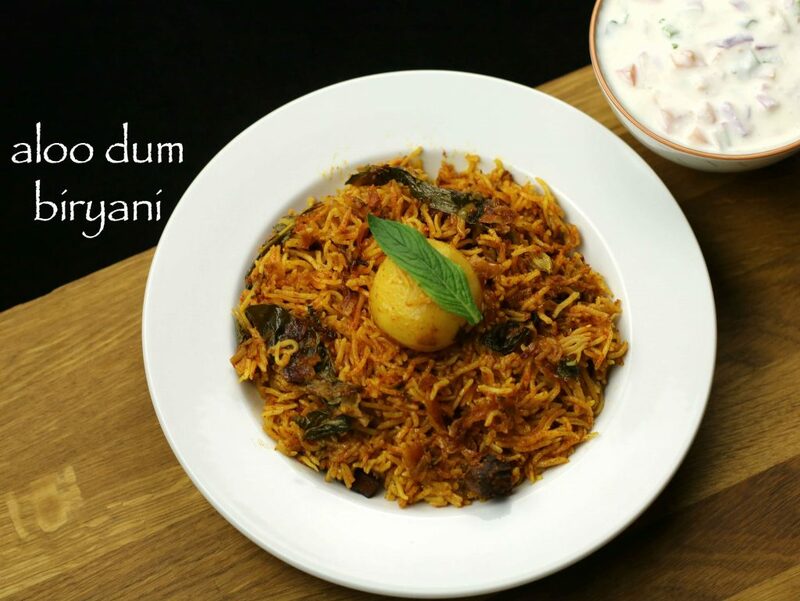 biryani recipe can be prepared in a simple way or in a complicated way. however the most important factor in biryani recipe is the rice. 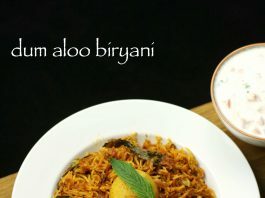 usually, in biryani recipe, rice is cooked separately and then added to biryani gravy in layers. while, this is the authentic way of preparing it, but things get complicated and time consuming too. 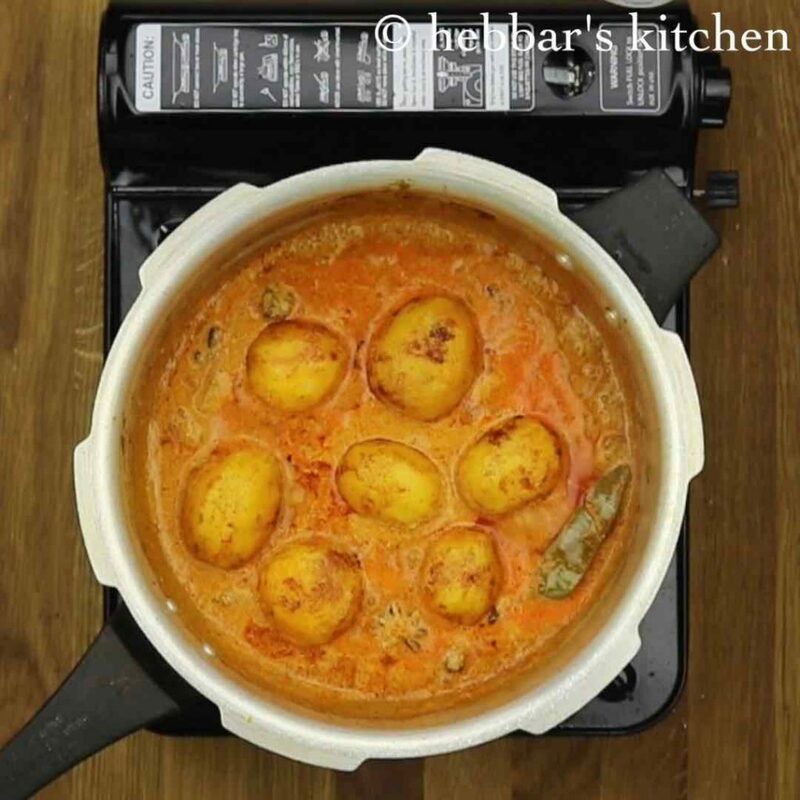 hence, in this recipe i have used pressure cooker to prepare the dum aloo biryani. basically, just add the dum aloo gravy and layer it with soaked rice. furthermore, once layered just cook the mixture for 2 whistles. aloo dum biryani is ready. furthermore, dum aloo biryani recipe is my and my husbands favorite recipe. to be honest we both love any version of vegetable biryani. whenever, we plan for outdoor dinners, biryani was always on the menu. however, after moving to australia, i wasn’t able to find any authentic biryani restaurants. most often, we would end up having a stale biryani. hence, we have almost skipped now having biryani in restaurants. but, the craving for biryani hasn’t died yet. so we end up preparing the varieties of biryani ourselves. 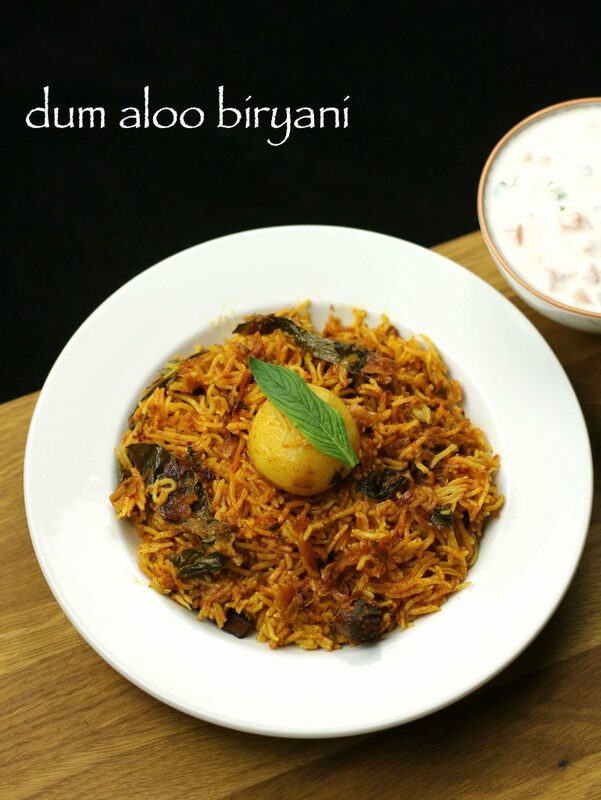 finally to conclude, do check my other biryani recipes. specifically, paneer biryani recipe and vegetable dum biryani. also, check out my simple onion tomato raita, bhindi ka salan for biryani recipes. furthermore, you can also check my other indian rice recipes collection. especially, tawa pulao recipe, corriander pulao recipe and coconut milk pulao. firstly, in a large bowl take baby potatoes. soak in for atleast 15 minutes in salt water. in a cooker add 4 tbsp of oil along with chilli powder and turmeric. 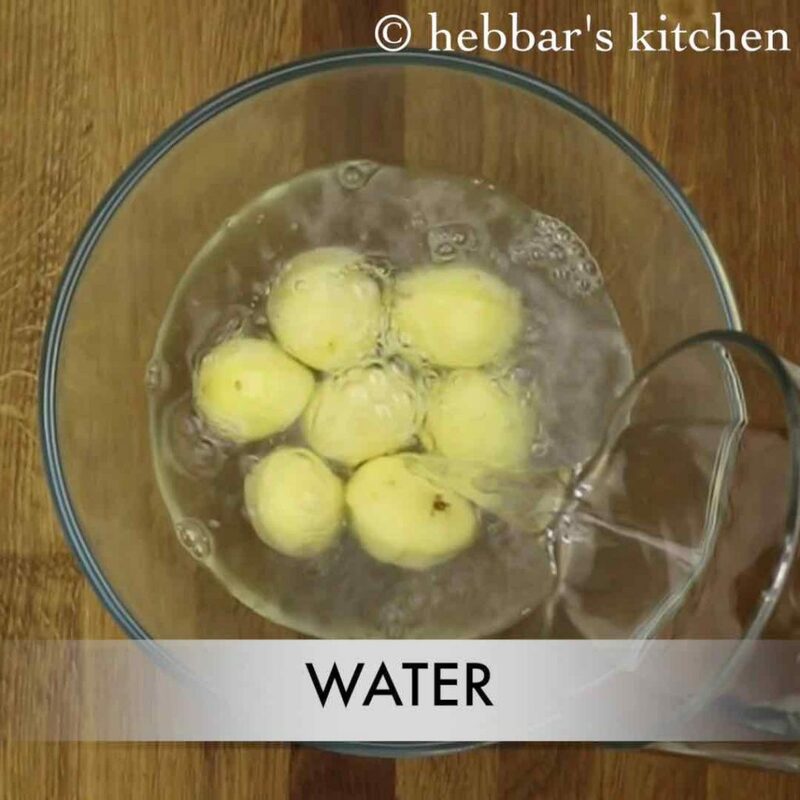 fry the soaked potatoes for 2 minutes. 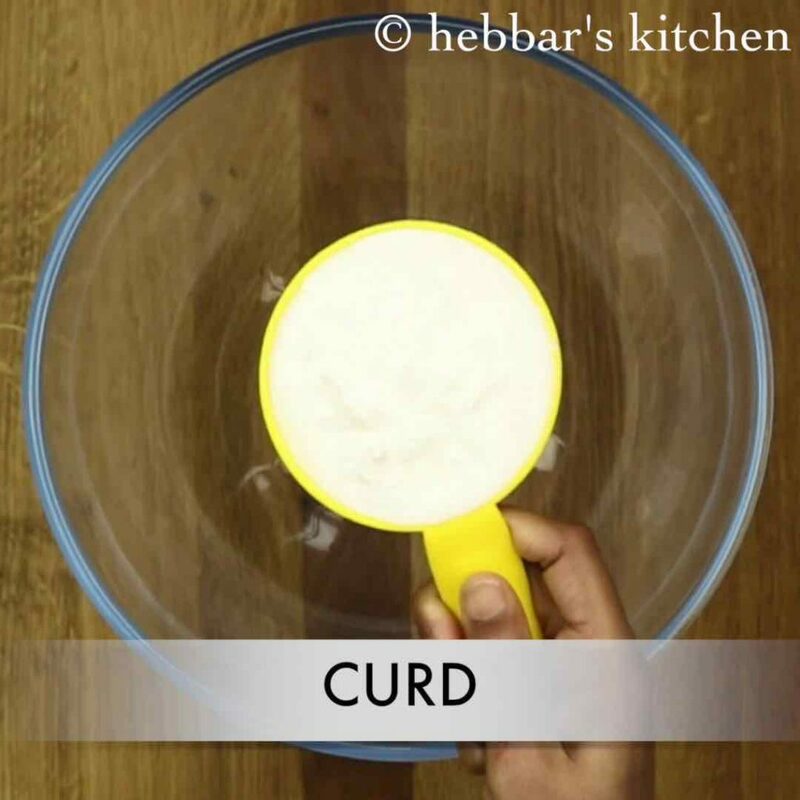 firstly, in a bowl take 1 cup of thick curd. add chilli powder, turmeric powder, biryani masala, fennel powder, ginger-garlic paste and salt and mix well. firstly, in a cooker add 3 tbsp of oil / ghee. 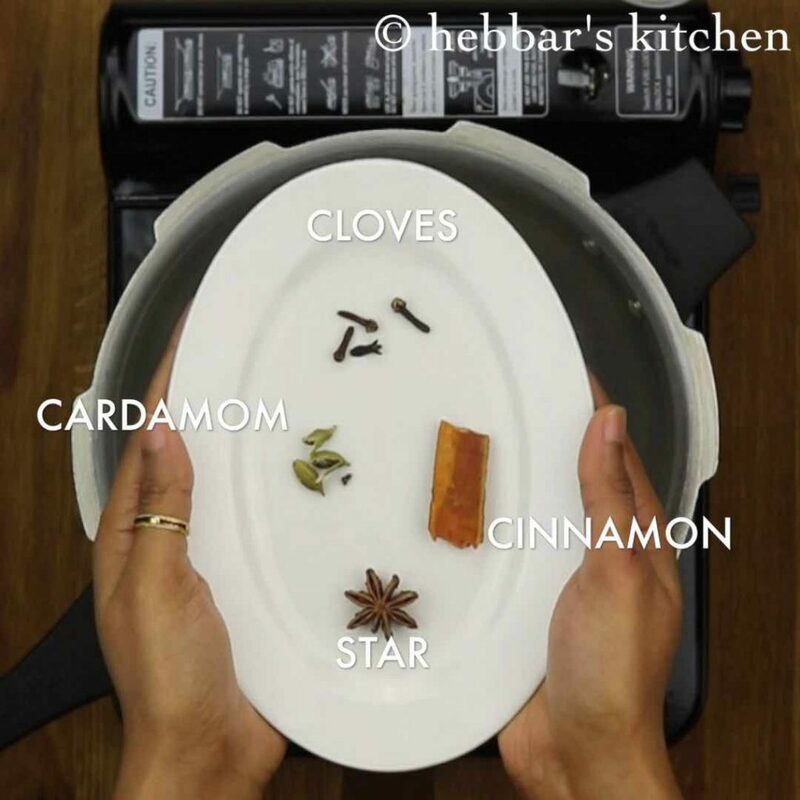 add spices like bay leaf, star anise, cardamom, cinnamon and cloves. now add the prepared curd mixture. place fried potatoes in it and spread soaked rice. 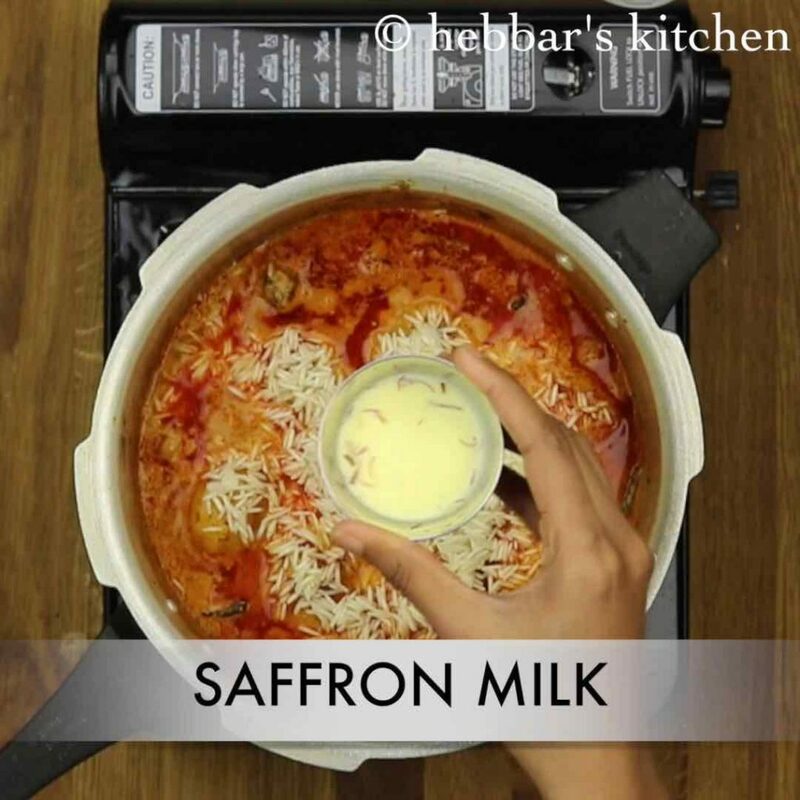 add saffron milk. place mint leaves and coriander leaves. after that, sprinkle fried onions / barista. furthermore, add 1½ cup of water. 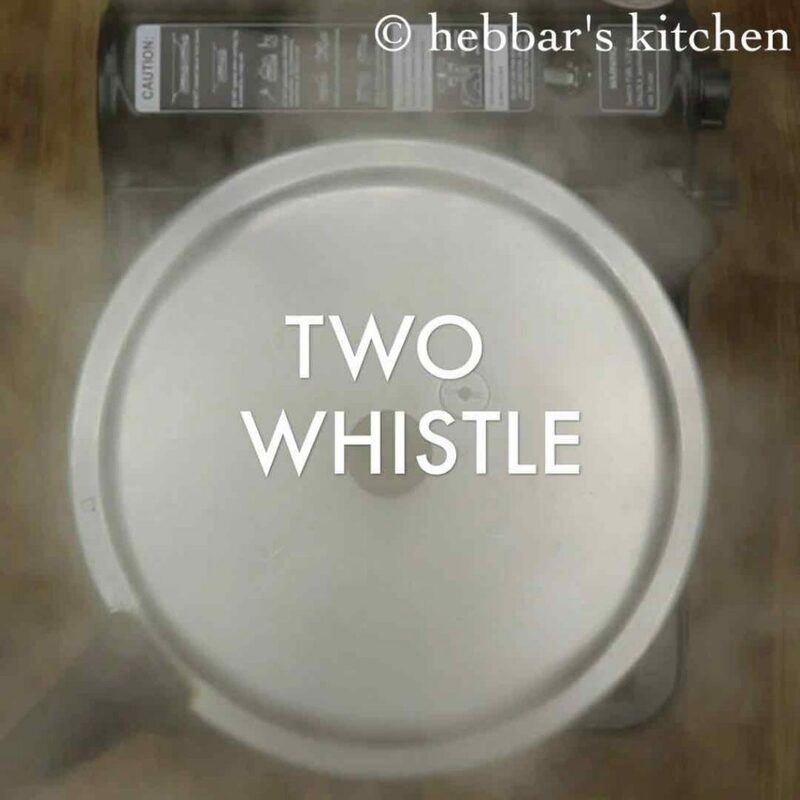 then pressure cook for 2 whistles. 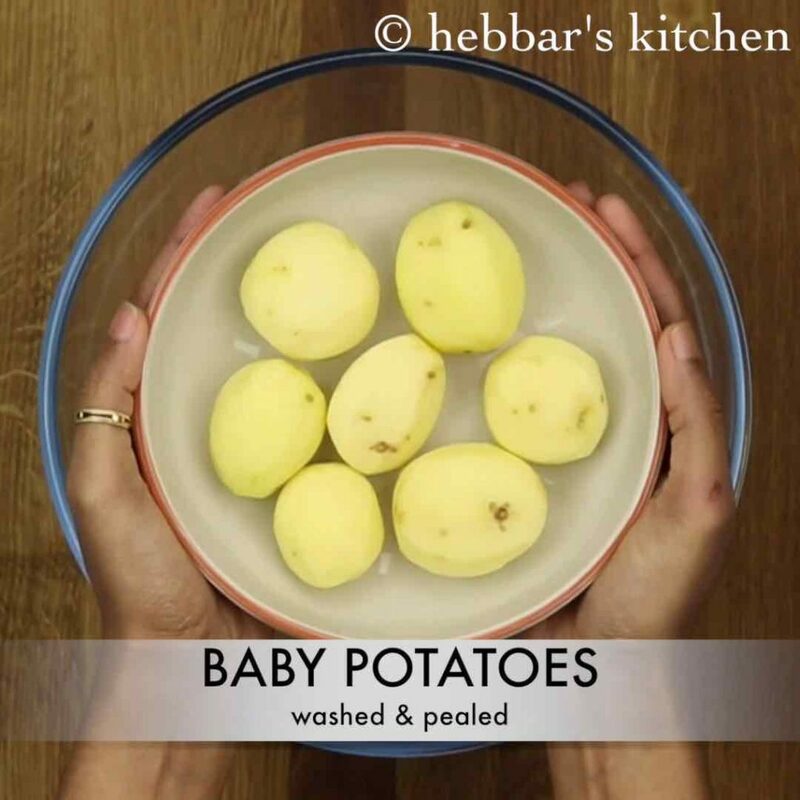 firstly, in a large bowl take washed and pealed baby potatoes. soak in for atleast 15 minutes in salt water. this helps aloo to absorb salt and also remove extra starch. furthermore, in a cooker add 4 tbsp of oil along with chilli powder and turmeric. 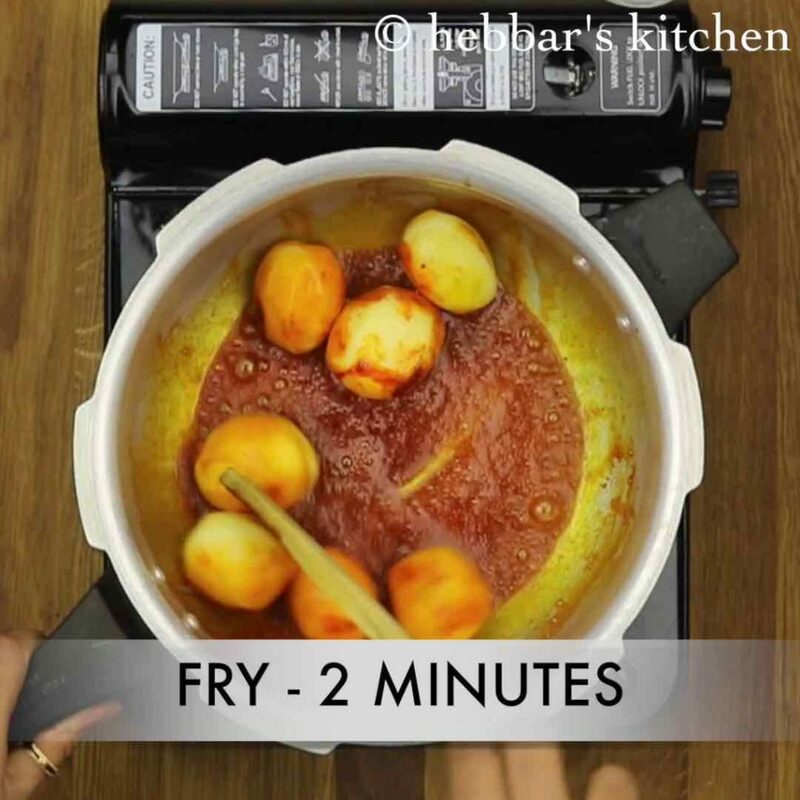 finally, fry the soaked potatoes for 2 minutes or till they turn golden brown. keep aside. 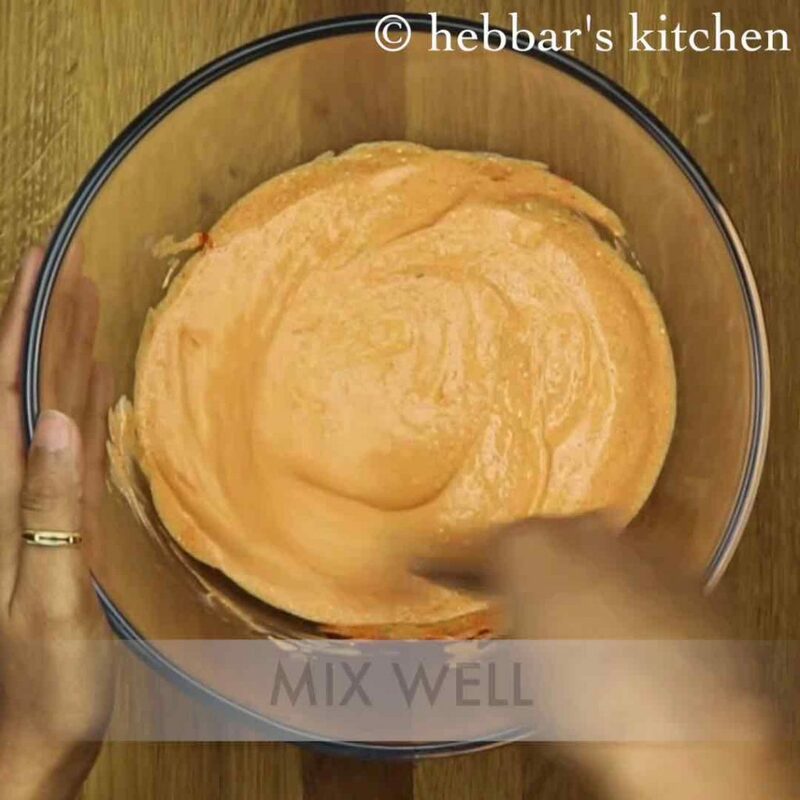 firstly, in a large mixing bowl take 1 cup of thick curd. additionally, add chilli powder, turmeric powder, biryani masala, fennel powder, ginger-garlic paste and salt. 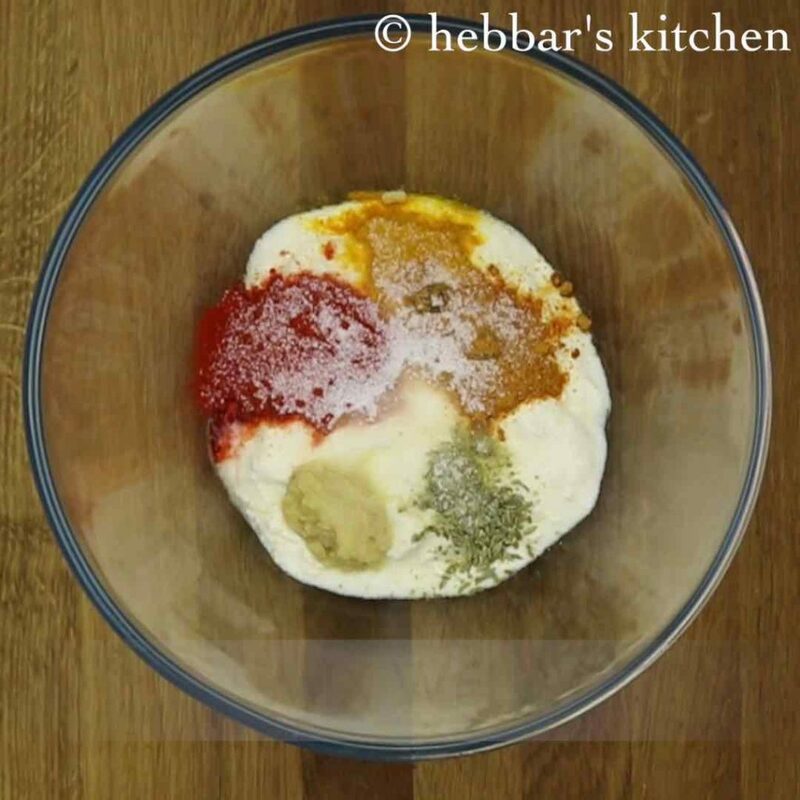 furthermore, mix well so that all the spices mix well with curd. keep aside. furthermore, add spices like bay leaf, star anise, cardamom, cinnamon and cloves. saute till they turn aromatic. 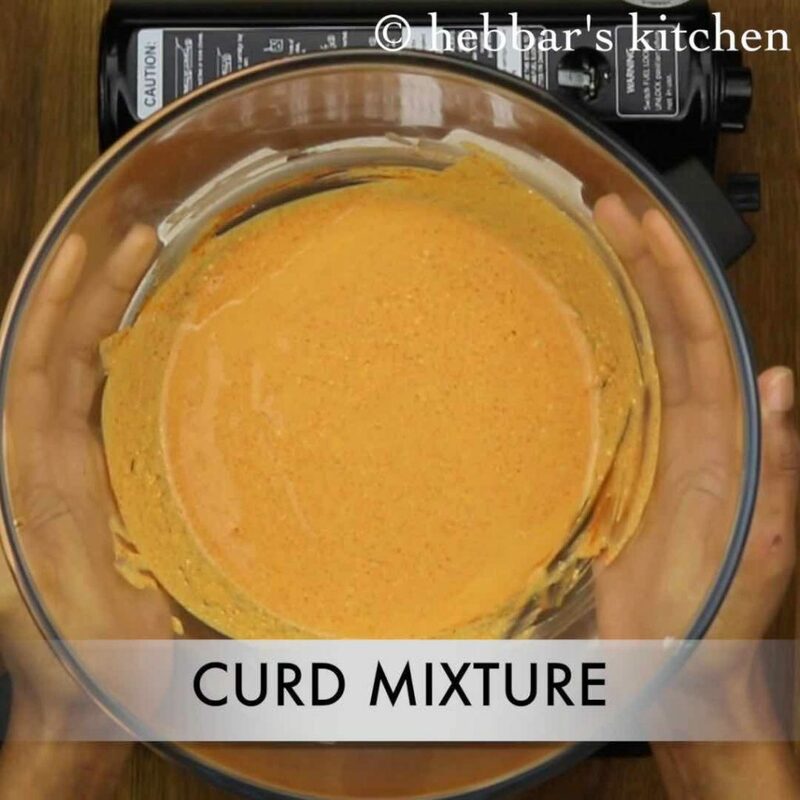 now add the prepared curd mixture and give a good mix. keep the flame on medium else there are chances for curd to curdle. once the curd mixture is about to boil, place fried potatoes in it. furthermore, spread soaked rice. to prepare soaked rice, soak 1 ½ cup of basmati rice for about half an hour in water. also add saffron milk. however this is optional, but it gives nice flavour. additionally, place mint leaves and coriander leaves over the rice. also, sprinkle fried onions / barista. 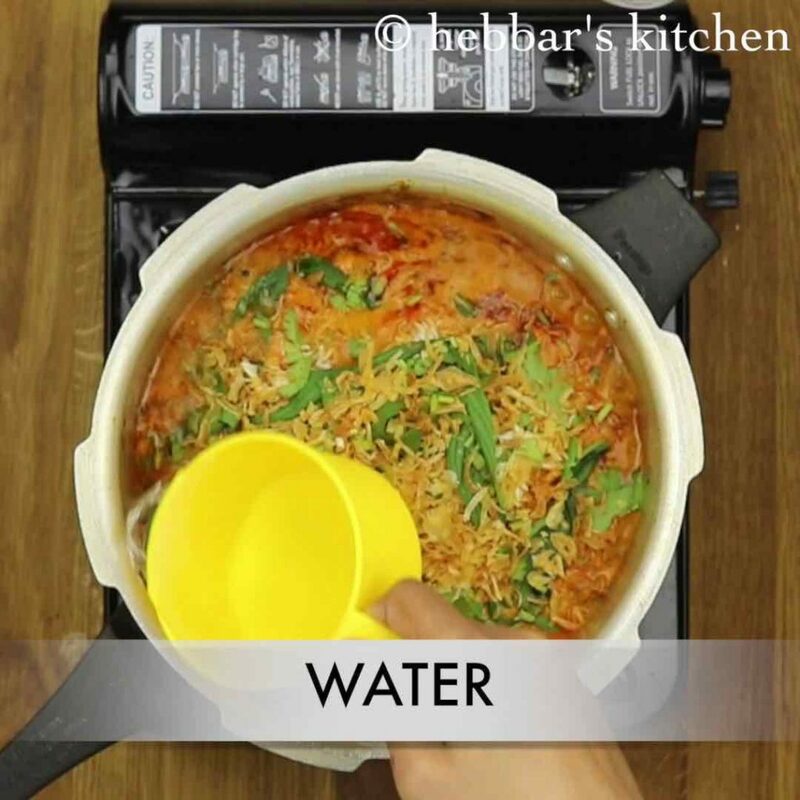 furthermore, add 1½ – 2 cups of water around the edges of cooker. without disturbing the biryani layers. then pressure cook for 2 whistles on medium flame. finally, serve dum aloo biryani with onion-tomato raita. firstly, do not burn the spices as the biryani will taste bitter. 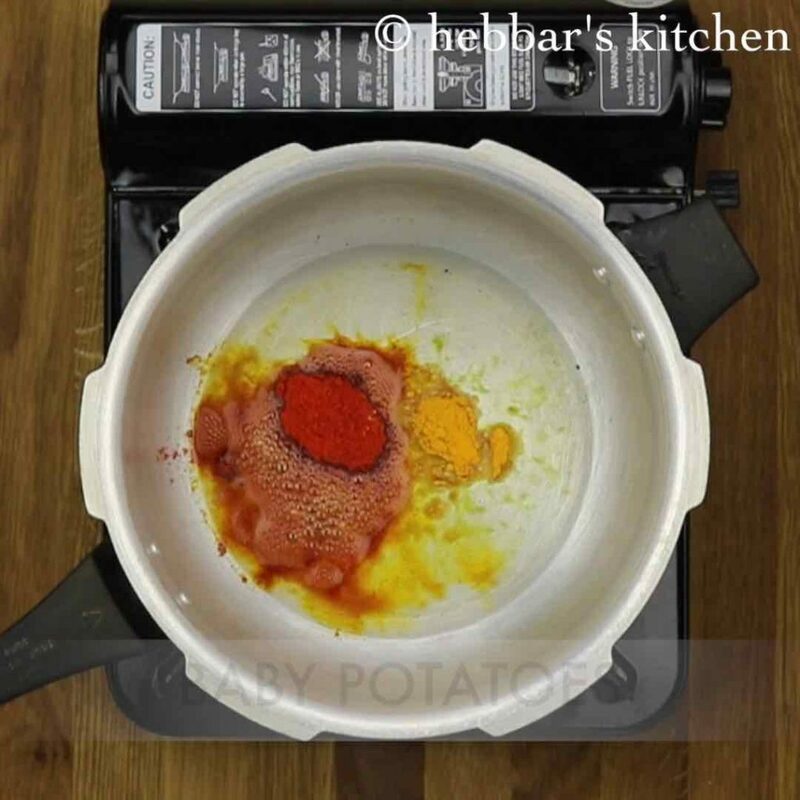 most of all, instead of frying potatoes with less oil, you can also deep fry till they turn golden brown. furthermore, biryani taste great the next day. by absorbing spices. additionally, if you do not have baby potatoes you can also use normal potatoes chopping into cubes. finally, cook the curd mixture on medium flame. how long do I have to soak the rice? soak minimum for 20 minutes..
Hi.. 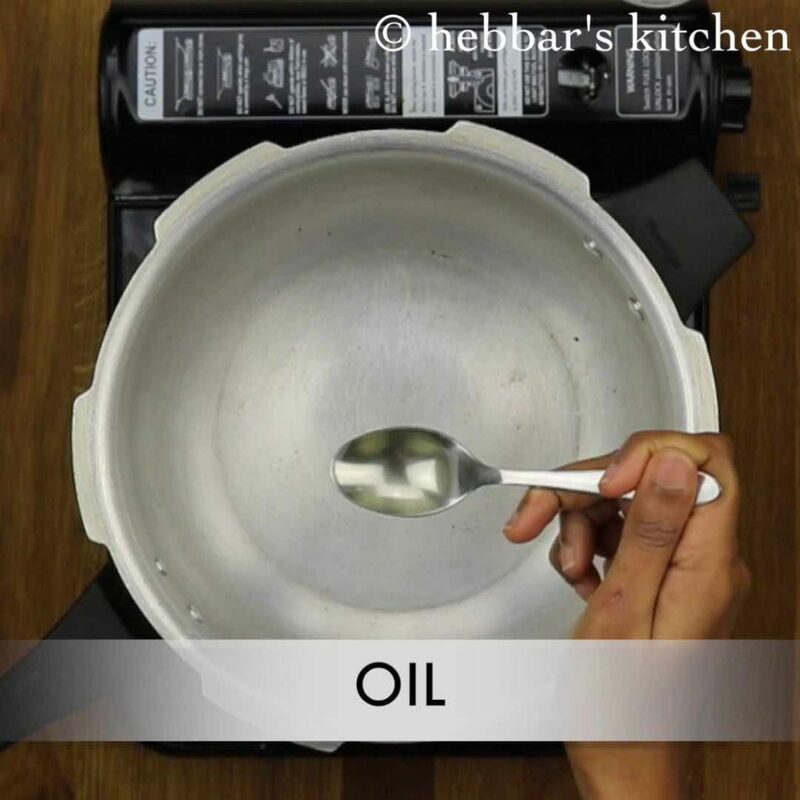 Thanks for these short and quick recipes… I’d like to know how many litres is the cooker that you showed here. I tried today. It came out very tasty. Thanks a lot Hebbars kitchen. I love all your recipes. Keep up the good work. I tried this today very tasty n yummy. Thank u so much. Where were you all this while☺️..I have been trying your recipes and they are just stunning..Love your videos❤️ and simple steps to get things done in a jiff.. God bless you! Tried this today.. came out perfect.. yummy .. This looks so good and your directions make it seem so simple! Just a couple of questions. First, is the soaked rice supposed to be cooked beforehand? And also, can this be cooked on a regular pot instead of a pressure cooker? Sorry, I’m a beginner when it comes to cooking desi food. Thank you in advance! No Nishat. 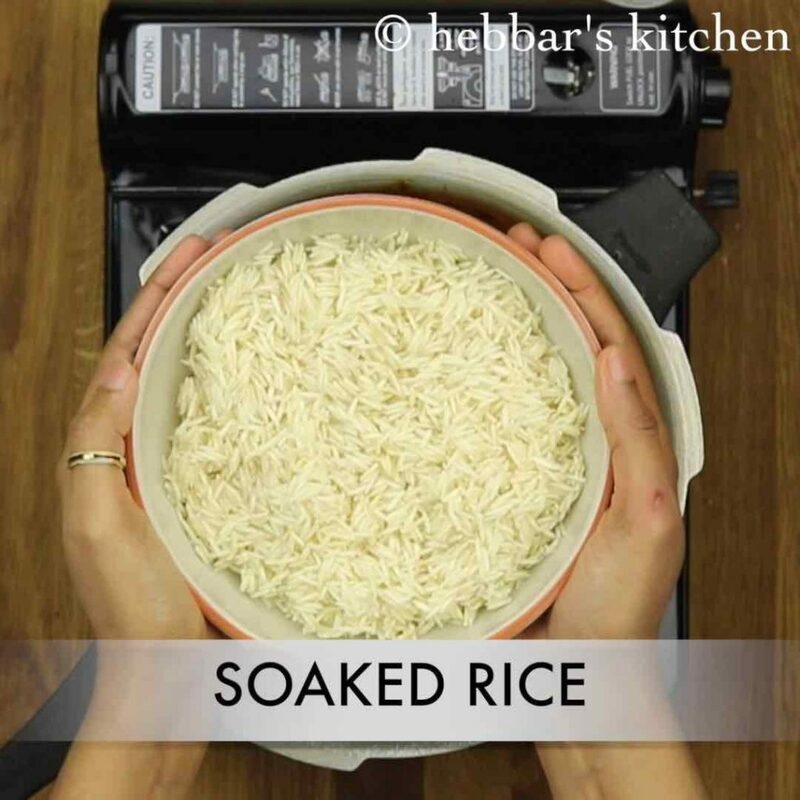 Soaked rice means you soak raw rice in water for 30 mins. than use it in cooker/or any other pot. if you are not using cooker, the cooking time may increase also keep an eye as it should not be overcooked. They have explained it in a most effortless way! Amazing! Hi..Tried this today..love it .Going to serve it tomorrow for lunch actually..How do I reheat this? Please let me know which biryani masala do you use. Tried your palak paneer recipe and it came out so well. What mint leaves are those? They look different to the ones we get. Yes it looks different and thats what we get here in Australia. but taste wise its the same. I tried this briyani today. It turned out so good. Thank you for this recipe. I tried Biryani Yesterday. It came out well, but was little spicy with the same measurements. But my only concern was, i cooked in normal pressure cooker, after two whistles, bottom was burnt and i lost 1/4 of my biryani in that. Any tips to avoid this? Hi, I have an electric pressure cooker, which does not have a whistle. how much would that be in minutes or hours?